I had to have a CT-scan this afternoon prior to my appointment with the cochlear implant surgeon. After being stuck in a huge white machine I was handed a giant envelope with about 10 sheets filled with “pictures” of my lovely insides to take to the surgeon. Afterwards, I had this huge plan to sit in my car for about 5-10 minutes and try to analyze my CT-scans even though I don’t know much about ear bones. On my walk back to the car I had a light bulb moment and realized that…hey! I bet my brain’s included in these pictures! I jumped into my car and tried to look for my brain (a whole head shot) photo. I kept pulling sheet after sheet of what showed my ear bones and cochlea….then finally! I found what I was looking for! My brain! How many people can say they’ve seen a picture of their brain?! Pretty niffy, eh? And yes, I’m sleep deprived. So, I’ve been a bit nervous all week….especially tonight. I shouldn’t be this nervous, but I am. My appointment tomorrow with the cochlear implant surgeon. I will basically make my final decision as to if I go through with it or not. I have 3 questions that I want him to answer. My final decision will be based on how those 3 questions are answered. So, why am I nervous? I’ve been trying to figure it out. I finally figured that it’s because I don’t want something to come up that makes me decide not to go through with it. I don’t want the surgeon to answer those 3 questions “wrong.” I think it’s hit me that I’m really nervous because I really do want to go through with this and I don’t want anything to stop me from going through with it. And on top of it all. I have a phone interview tomorrow morning (my 2nd one for this particular position). I’m fascinated by this website. I copied and pasted a description from their website. What fascinates me the most is how I actually had to look for “deaf.” I thought for sure that would be one of the larger words. Instead, “hearing” was. I’m tempted to do this every few months to see how it changes over time as things in my life changes. *shoo* go and do yours! Elephant Shoes or Olive Juice? This is going to be yet another short post. I want to emphasis 2 things in this post. 1) Lipreading isn’t as easy as one may think. 2) Only 25-35% of spoken English is readable on the lips under ideal conditions (which rarely happens) and without any auditory input (hearing aids, cochlear implant). Anddd……now…..*drumrolll* I present my first vlog! It’s been a while since I’ve blogged about genetics. I usually don’t read SELF Magazine but I happened to grab a copy for some easy reading. I didn’t realize until after I bought it that there was a section (7 pages) about genetics. This article starts out talking about how many genetic conditions are caused by environmental and genetic factors (aka multifactorial/complex diseases). This point was addressed several times throughout the article. I was glad to see that it was addressed because many people think genetics is black/white and their genes determinate 100% of their health. Whereas that is not always the case; genetics is very gray. Just because you have a gene for a certain genetic condition (e.g. cancer) doesn’t necessarily mean that it’s 100% for sure you will develop it. The article then goes on to talk about how to do your own personal family history intake for heart disease, diabetes, colon cancer, blood clots, breast cancer, and ovarian cancer. There are little notes about why it’s important to record the age of diagnosis in each family member. I have to admit I did cringe a bit when I realized that SELF Magazine was asking their readers to do their own family history intake to assess their own personal risk. However, I was glad they mentioned genetic counseling a few times and the importance of genetic counseling for family history of early onset cancers. Apparently, they even contacted the president of NSGC (National Society of Genetic Counselor). Then, readers can use the “handbook” to learn more about each condition (heart disease, diabetes, colon cancer, blood clots, breast cancer, and ovarian cancer). It was interesting to read page after page of what women can do to reduce their risk of developing each of those conditions even if they’re predisposed to it. 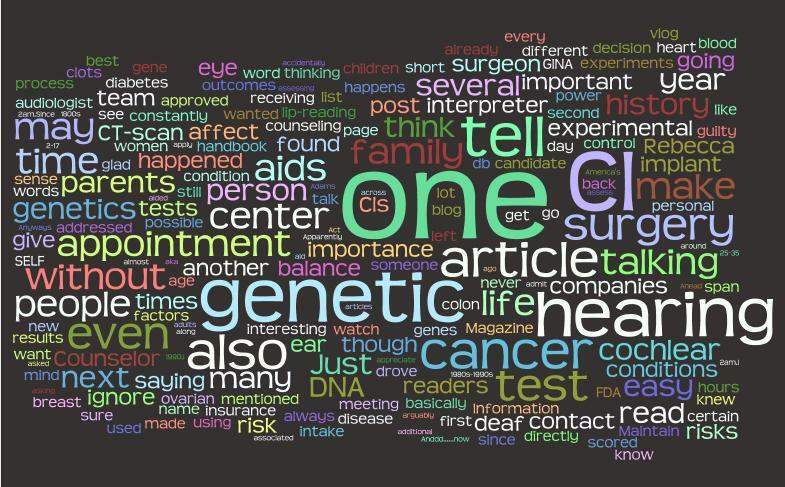 I think it gives readers a sense of power and control that they don’t always feel like they have when it comes to assessing their genetic risk based on their family history. While this article does try to give women the power of education and the sense that they have some control, it does emphasize the importance of consulting with a geneticist/genetic counselor. I had a CI evaluation appointment yesterday to verify that I’m a CI candidate. There has never been any question as to if I’m a candidate for a CI, but it’s part of the procedure. It’s also important to have this done for insurance purposes. As I was driving up to the CI center I was thinking about how life really does seem to go in circles. Twenty-three years ago my parents drove ~4 hours to the very same center to get a second opinion. Thankfully it’s now a 40 minute drive 😉 Anyways, they drove me up to this very same center and spoke to a CI surgeon. This doctor encouraged my parents to implant me even though he referred to it as an experimental surgery and it was in the trial phases (basically, I would have been one of his guinea pigs). Even though experiments have been dated back to the 1800s, it wasn’t until the 1980s-1990s that these experiments became reality. To give another idea of how new this technology still is. Cochlear is the oldest cochlear implant company. The very first Cochlear recipient was in 1978. Cochlear America’s office wasn’t even established until 1984. FDA approved CIs for adults in 1985. Clinical trials for children in the US also started in 1985. Let me clarify that 1985 was the year my parents took me to this CI center. It was definitely a very new and experimental surgery and no one knew what the outcomes would be. No one knew what kind of training would be successful with a CI. There were just too many unknowns at that time. CIs weren’t approved by the FDA for children (age 2-17) until 1990. I couldn’t help but think that I was going back to the very same center where one of the doctors wanted me to undergo an experimental surgery. I have to say that it had to be a very difficult decision for my parents to make and I 100% believe that they made the best decision for me at that time to not be implanted. Anyways, the appointment lasted about 2 hours. The audiologist mentioned a few times that it was a very easy appointment for her and a fairly short one. I had already read a lot of studies about CIs, I did my “homework”, and I have the benefit of having friends who have CIs. Some people have asked me what happened during my appointment. Basically we just talked about the reasons why I was interested in receiving a CI and the best CI “brand” for someone with my background. I also had several hearing tests. One with my hearing aids, one without, one with my hearing aids in my right ear only, one with my hearing aid in my left ear only, etc. I found out that my hearing has dropped 5 db in my left ear and I’ve somehow lost about 15 db all across the graph when aided. The audiologist checked my hearing aids and they’re at the maximum setting possible. She also gave me 2 additional tests. One was where I had to tell her what words she was saying without lip-reading (with hearing aids). I scored a very low 0% on that test, lol. For the second test I was given a list of words where I had to choose from the list which word she was saying (once again no lip-reading). I scored 55% on this. There are several steps involved in the process of receiving a CI. The next step is to have a CT-scan to make sure there are no structural issues with my cochlea that may affect surgery and outcomes. I will also have a balance test after my CT-scan because CI surgery can affect your balance. After that I will meet with the CI team including the surgeon. I’m looking forward to meeting with the surgeon because I have several questions about long-term risks associated with the surgery itself. How significant these risks are to me is what will determine if I decide to be implanted. I’m already pretty familiar with these risks but I want to hear them directly from the surgeon. The next appointment (CT-scan, balance test, and team meeting) is next Thursday so tune in next week! My Name is Not "Tell Her"
I was going to blog about a different topic but I’ll save it for another day since it requires a certain level of thinking that I’m not capable of at 2am. I was heading to bed and happened to see this video of Marlee at the 1998 Oscars. If you do watch this, please do not do what the reporter/interviewer does. One of my pet peeves is when people constantly say “tell her.” I don’t mind when a person is not used to using an interpreter nor do I mind it if it happens every once in a while. (I’ve been guilty of this myself.) It’s a whole different story when someone does it constantly after I’ve explained that they don’t need to. They can just ignore the interpreter and talk directly to me. Most of the time I ignore it unless it’s with people that I interact with on a daily basis. Why is it important to me? I would say a lot of it has to do with respect. I could go into more details here but it’s 2am. So, for those of you who aren’t used to using an interpreter…I have 2 suggestions that many deaf people will greatly appreciate and will make the situation more comfortable for both sides. If you happen to forget to maintain eye contact or if you accidentally say “tell him/her.” No worries, we won’t bite you. We’ve been guilty of doing the same thing when talking to a hearing person through an interpreter. Hopefully tomorrow I’ll remember what I originally wanted to blog about.